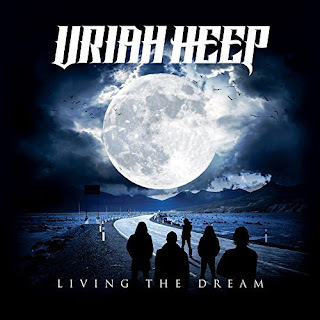 Δελτίο τύπου: «Uriah Heep are releasing their anticipated brand new studio album - the 25th in their storied career - which will be titled, appropriately enough, "Living The Dream". "We have been together for 47 years and we have seen many bands come and go, so in effect we are 'Still Living The Dream,' so it was the perfect title for the new album," says Uriah Heep guitarist and founding member Mick Box. ROCK STAR 6 Ιουνίου 2018 - 11:39 π.μ. BALADEUR 9 Ιουνίου 2018 - 8:00 μ.μ. METAL BLOGGER 7 Ιουνίου 2018 - 10:52 μ.μ. Τρομερή φωνή και πολύ καλό τραγούδι. BALADEUR 9 Ιουνίου 2018 - 8:01 μ.μ. Manilla Road 8 Ιουνίου 2018 - 3:16 μ.μ. Μπράβο στα παππούδια. Το 'χουν ακόμη. BALADEUR 9 Ιουνίου 2018 - 8:04 μ.μ.